Last week we decided to bite the bullet and replace our old Keurig that had gone toes up a few weeks earlier. When trying out this new one, which is a model 2.0 that we got from Costco , John was disgusted to discover that the Refillable Single K-Cup Brewers that we’ve been using with our old Keurig don’t work on this new version. He called the company to find out where to get a new refill cup, but was told that the new Keurig was designed only to be used with the toss-away cups. 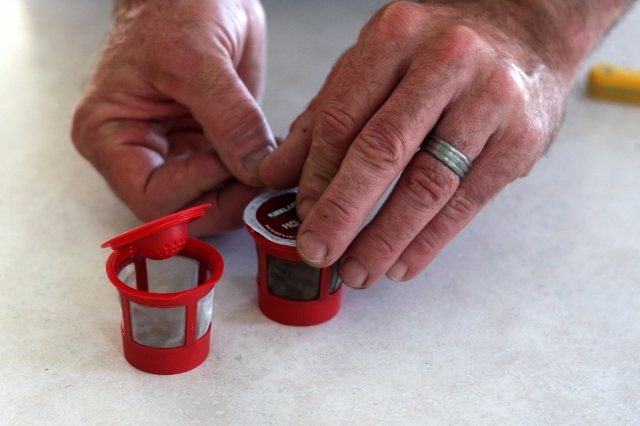 The worker explained that the machine is fitted with an electronic eye that reads the top of the K-cup. So not only will it not ‘read’ the refill packs, it also won’t read some of the more affordable ‘off’ brands of throw-away cups. John was aggravated at first, but then he had a great idea. 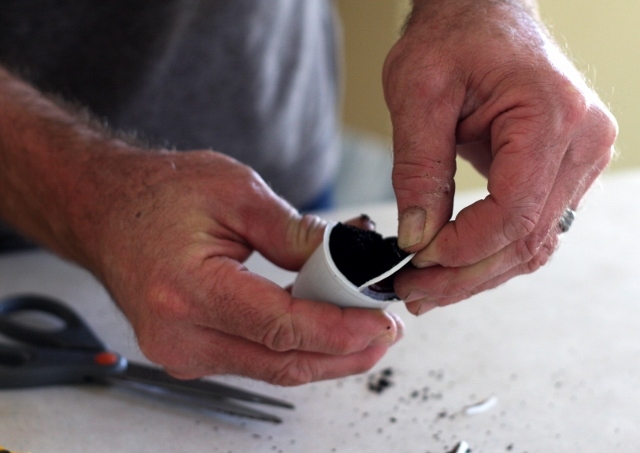 He carefully removed the foil top from a K-cup that had already been used, and simply taped it to the top of one of our refill cups. In these photos he used clear packing tape, but we found that duct tape, cut into thin strips to cover only tiny bits of the foil, is actually more durable. He then stuck the refillable cup into the coffee pot. Voila! The electronic eye had something to read, and it merrily chugged out a cup of coffee with nary a complaint. 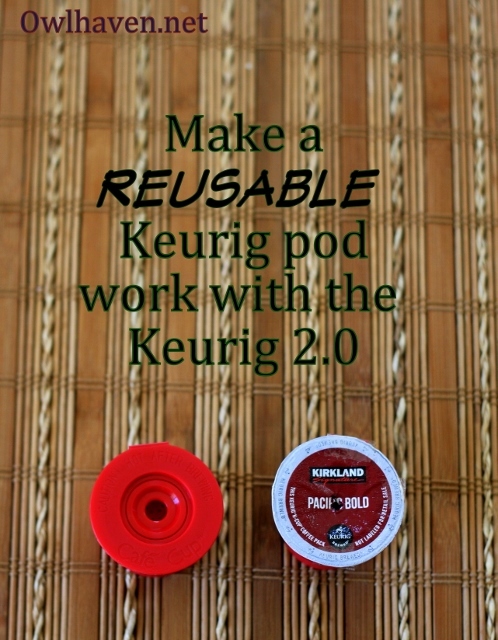 I thought this was such a good idea that I decided to share it here, in case others of you have bought the Keurig 2.0 and were also frustrated by the same problem. Note: After writing this post, I googled the problem and came across this video telling how someone else solved this problem in a very similar way. That way didn’t work for us– the foil crumples when you open and close the lid, but it might work for others, so I’m including the link just in case. We recently had to replace our Keurig machine from 2 years ago and read the reviews of the new one with much disappointment. We chose a Cuisinart brand machine and love the versatility as well as the functionality. Honestly, I think this is the last Keurig we are going to buy. There are so many other options out there! A salesman told me of this issue and suggested a “fix” just like this. I think this is a big mistake on Keurig’s part as I think many people will do just as Terri says and will purchase a different brand. If mine ever dies and I cannot find the older model for sale somewhere, I will definitely be picking something else. I don’t drink enormous amounts of coffee but this level of control is unacceptable. 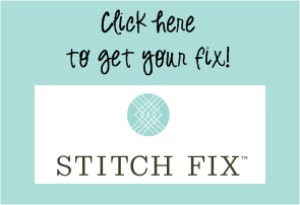 I know– they just aren’t inspiring customer loyalty at all, despite the convenience.